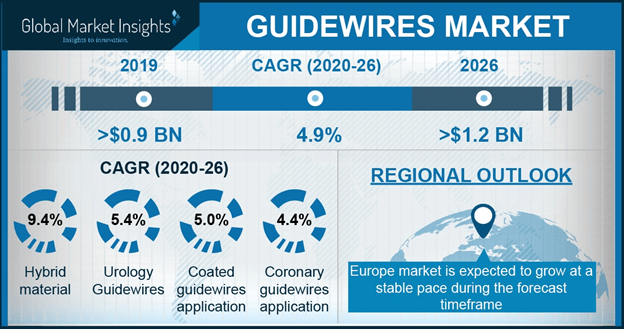 Guidewires Market size is set to exceed USD 1.2 billion by 2024; according to a new research report by Global Market Insights. Growing geriatric population base across the world will spur demand for guidewires in upcoming years. According to United Nations, an estimated 962 million people across the globe aged above 60 years of age. This number is estimated to reach to 1.4 billion by 2030. Declining fertility along with increase in international migration and longevity are the major factors leading to high geriatric population. With increasing geriatric population, the number of chronic diseases will increase, thereby leading to increased needs for guidewires and propelling market growth. Increasing number of chronic and lifestyle disorders in the world is one of the major factors driving the market. According to WHO statistics, in 2016, about 58 million people suffer from chronic disease in India. Increasing inclination towards sedentary lifestyle and lack of physical activities coupled with unhealthy diet and smoking are the major factors leading to rising number of chronic diseases and will spur industry growth. Coronary guidewires market accounted for largest revenue of USD 368.6 million in 2017. Number of people suffering from coronary diseases is increasing annually. This is attributable to rising adoption of sedentary lifestyle and increasing inclination towards smoking. Also, with increasing geriatric population, the number of coronary diseases will increase, thereby driving coronary guidewires market across the forecast timeframe. U.S. market contributed to revenue of USD 253.6 million in 2017, owing to availability of cutting-edge and advanced medical treatments to patients. According to American College of Cardiology, in 2017, coronary heart disease was one of the leading causes of death in U.S. Increasing number of patients suffering from chronic diseases will favor industry growth in U.S. Well-established healthcare infrastructure and availability of reimbursement will drive business growth in the future. Japan market occupied a significant share of 38.2% in 2017 owing to presence of large number of people aged 65% and above. Japan demographics suggest that more than 20% of the Japanese population are aged above 60 years. Furthermore, Developing healthcare infrastructure and high per-capita health expenditure will boost the market in Japan. Well-established medical infrastructure and stable political environment are major factors propelling industry growth. Some of the prominent players involved in market are Abbott, AngioDynamics, Asahi Intecc, B. Braun Melsungen AG, Boston Scientific, Cook Medical, Medtronic plc, Stryker and Terumo Corporation. These firms adopt strategic initiatives including opening of new establishments, mergers and acquisitions, and geographical expansion. For instance, in April 2018, Asahi Intecc announced that it began direct sales of PTCA guidewires in U.S. This strategy will enable company to strengthen its market position in U.S. and drive revenue generation.